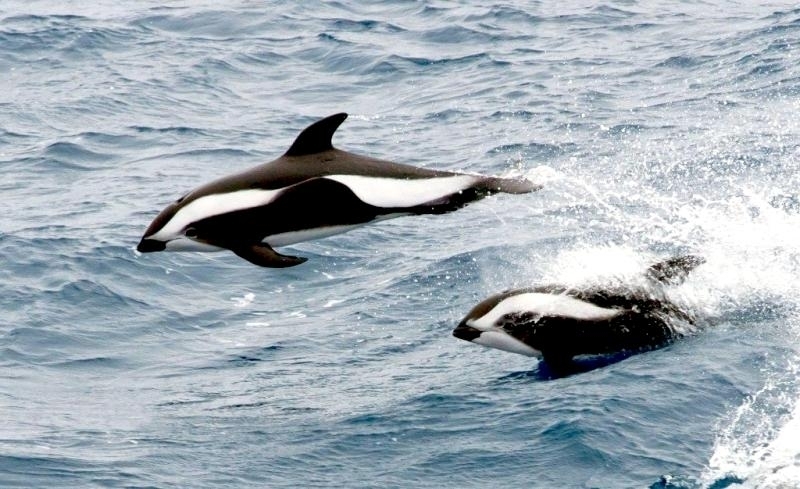 Hourglass Dolphins are small cetaceans with stocky bodies and characteristic black & white color patterns resembling an “hourglass”, hence their name. 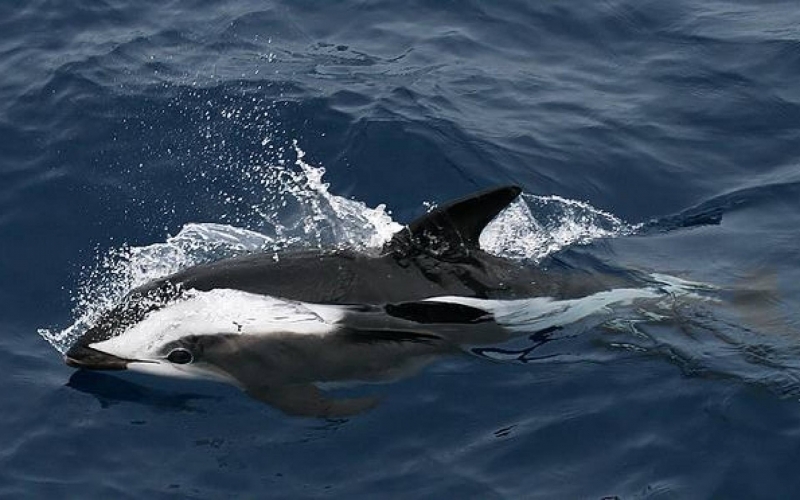 These markings vary greatly among individuals. 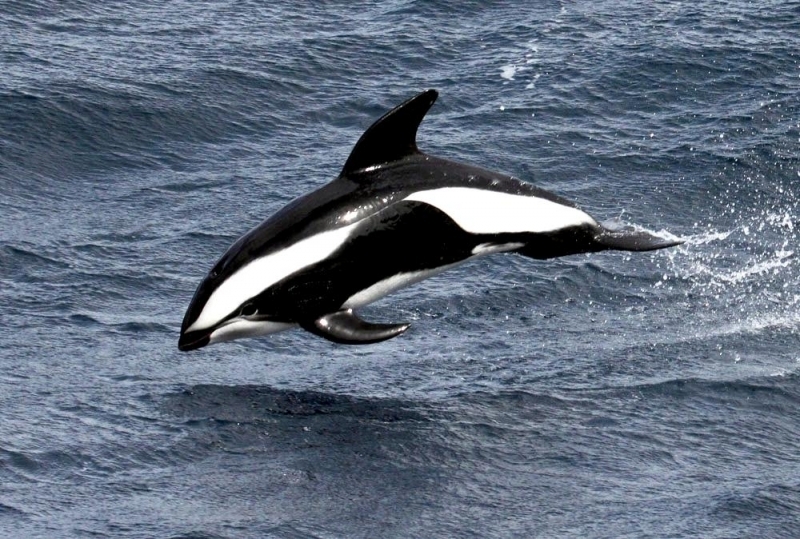 Based on the few records that exist for this species, they reach an average of 1.57 meters in length in females, 1.75 meters in males. 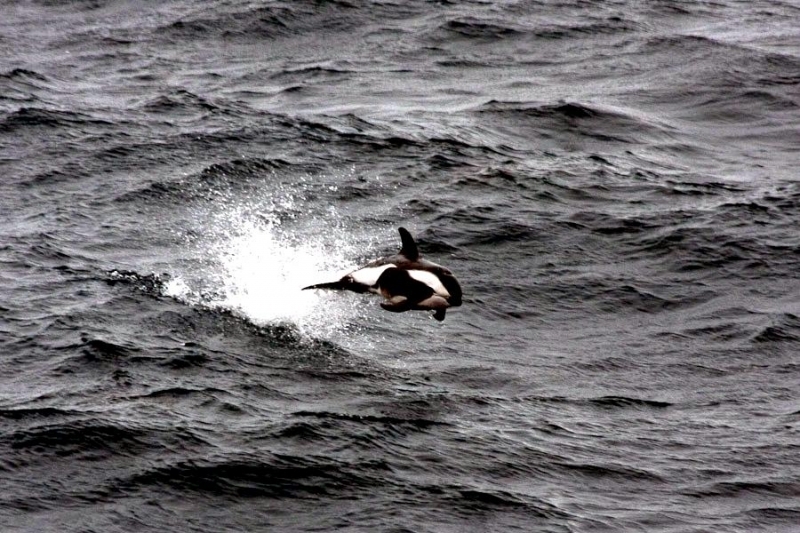 Weight data is also scarce for this species, however the few weighed were between 74-94 kilograms. 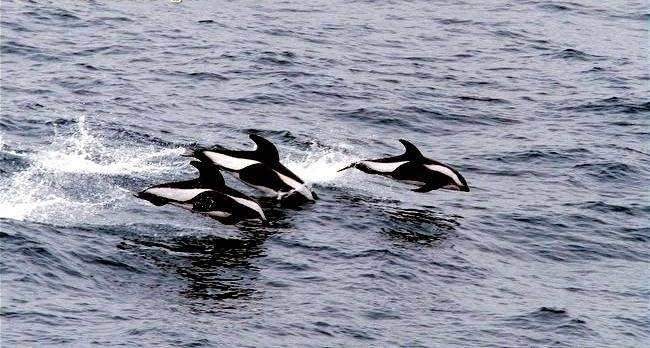 They are mostly black in color with 2 white patches. 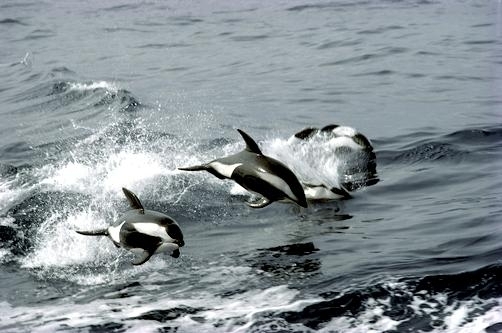 The first patch begins behind their beak, extends over their eyes, widens to the hourglass shape then tapers at their dorsal fins. 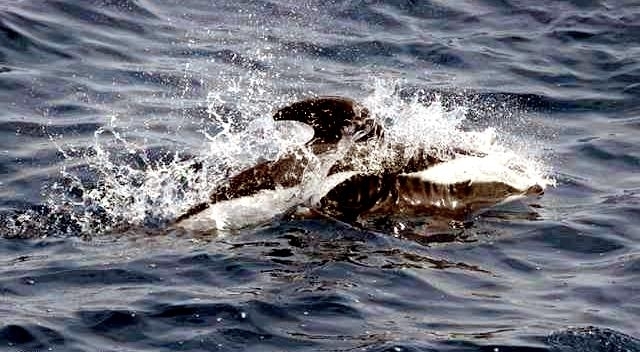 The second patch begins mid-flank at their dorsal fins, widens toward their posterior (rear) end and tapers at their tail. 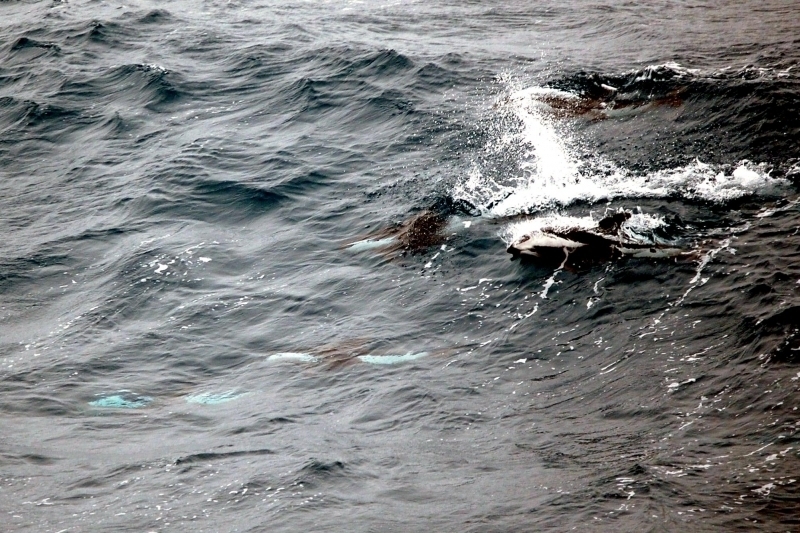 Their ventral (under) surface is mostly white. 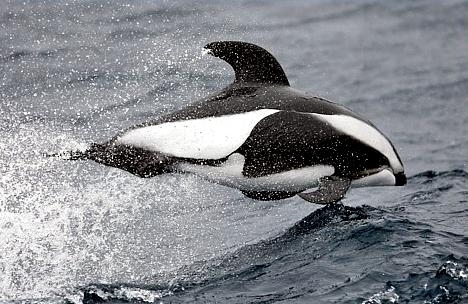 They have conical teeth, 26-34 teeth in their upper jaws and 27-35 teeth in their lower jaws. 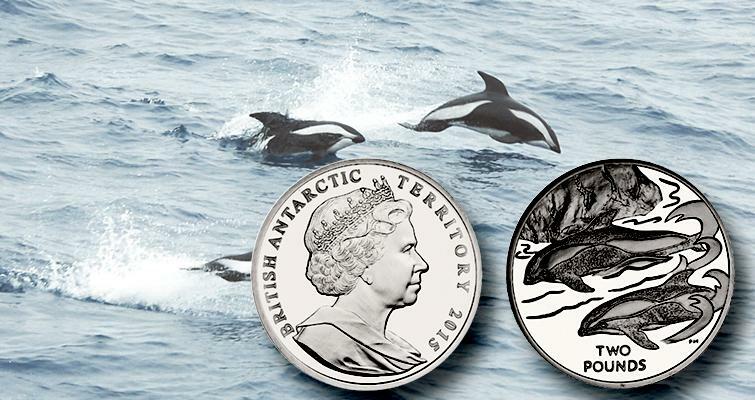 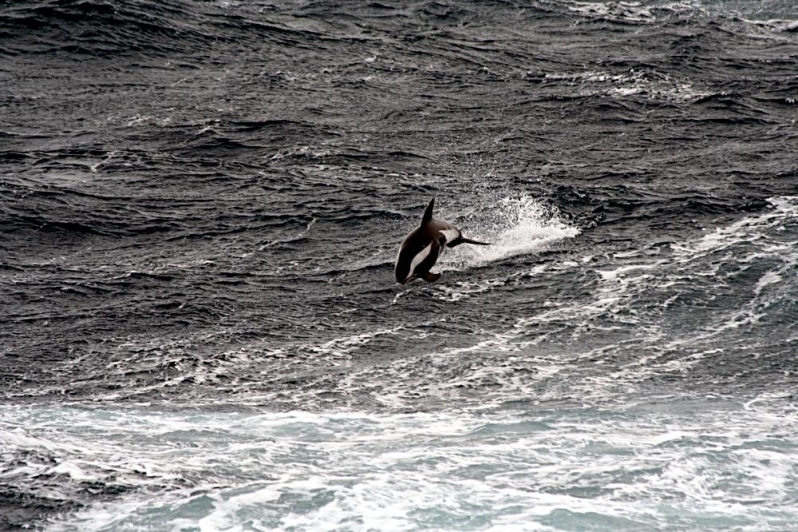 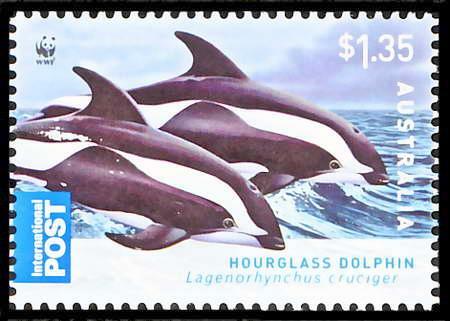 This species is the only small cetacean with a dorsal fin found below the Antarctic convergence making them easily distinguishable from other dolphin species there. 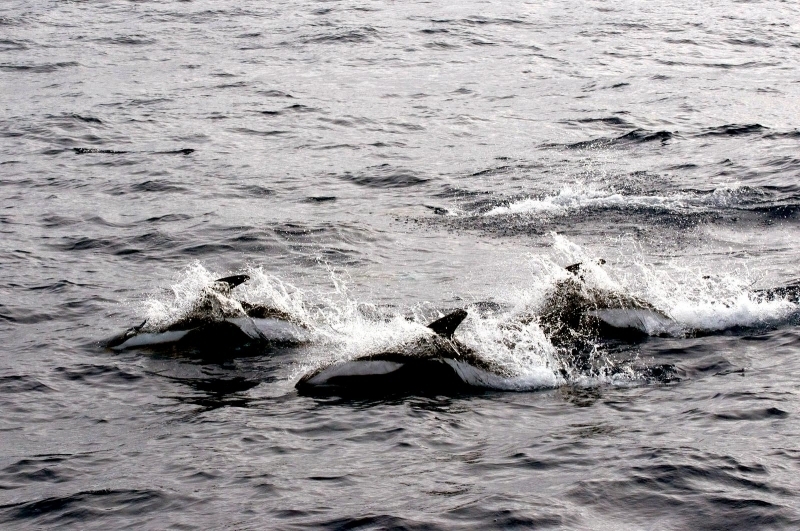 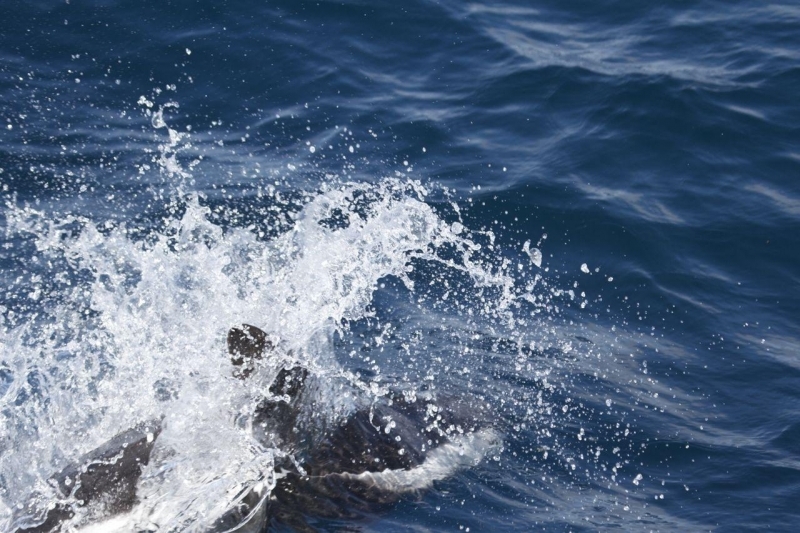 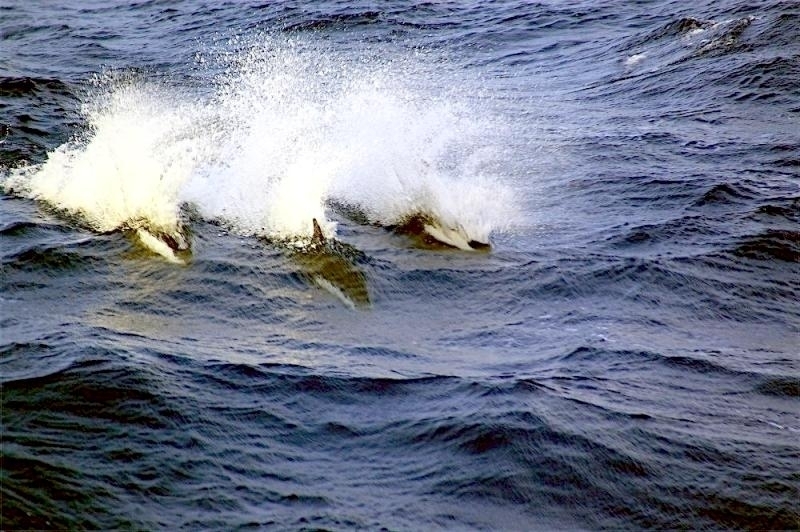 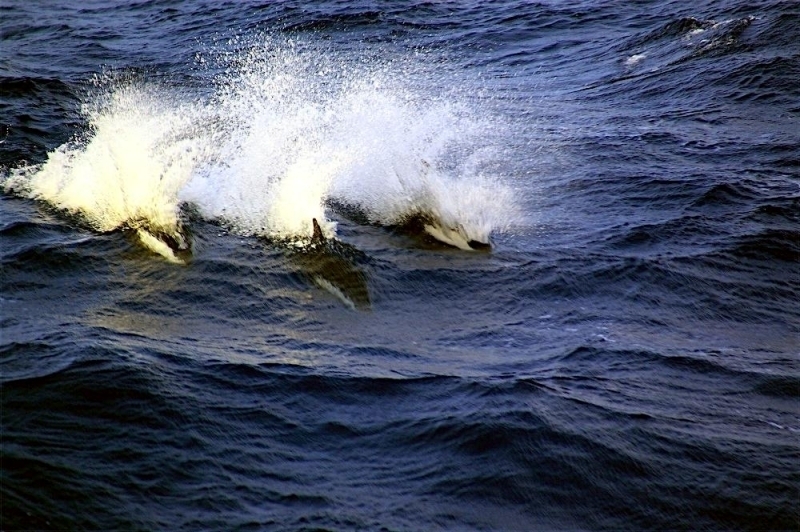 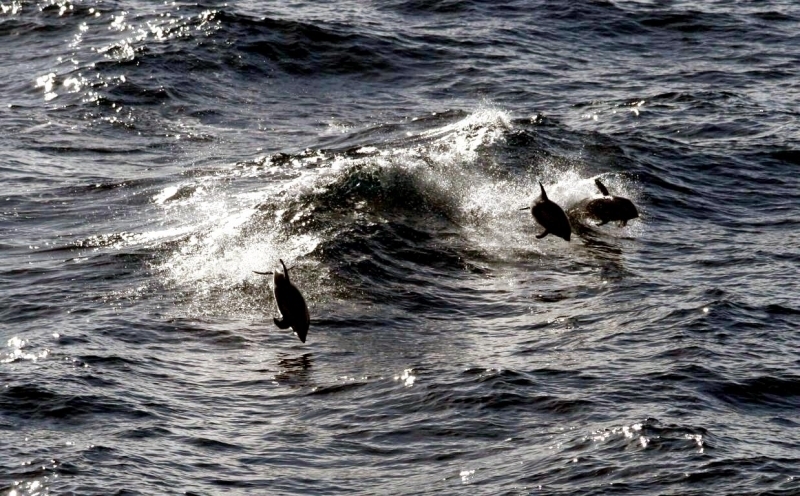 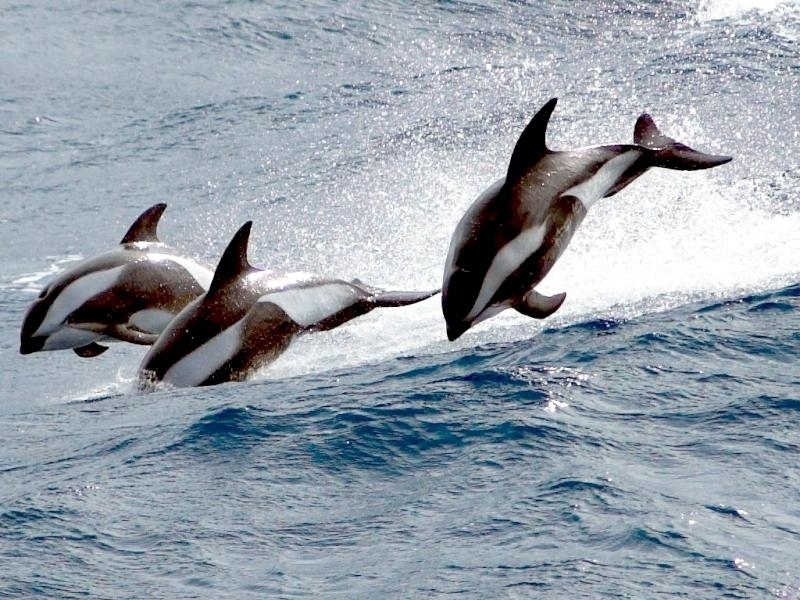 Above the convergence, they may be confused with Dusky Dolphins & Peale’s Dolphins. 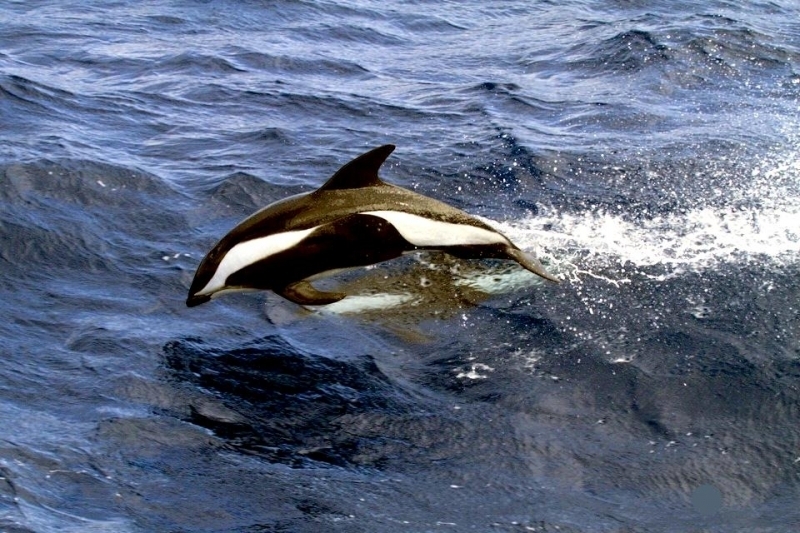 Hourglass Dolphins are a gregarious species that forms pods up to 100 individuals. 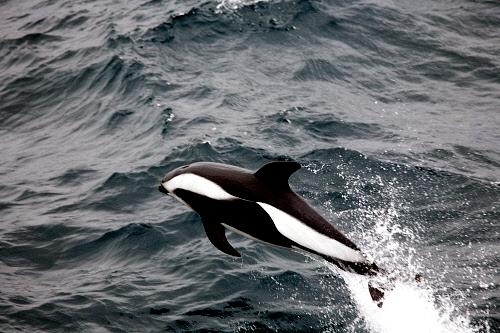 Their average pod size is 7 individuals. 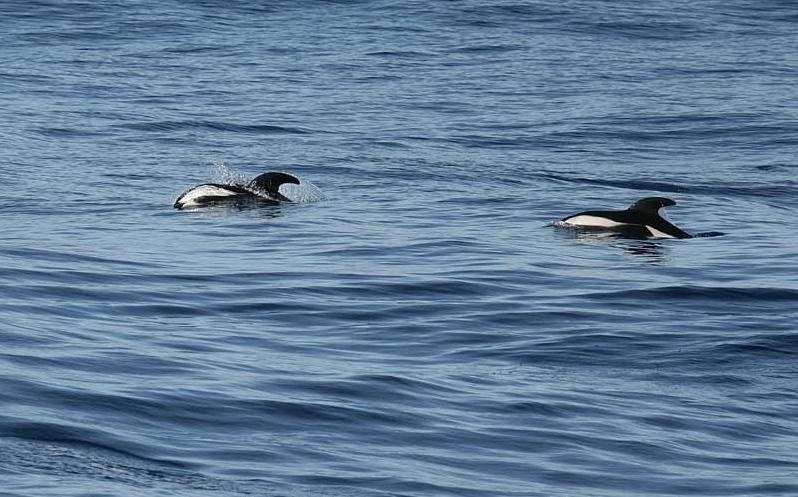 In studies of the social habits of Hourglass Dolphins, only 3 calves were identified out of a group of 1,634 individuals. 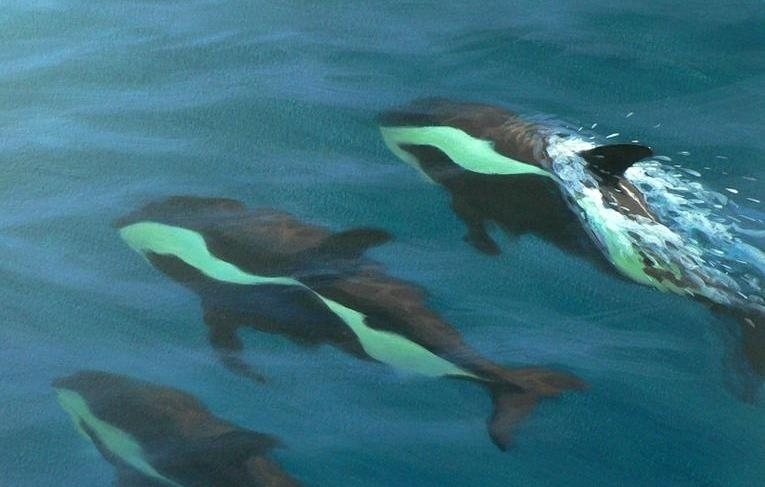 This may be due to a winter birthing season when the weather prevents studies from being conducted or due to females protecting their calves by avoiding research vessels. 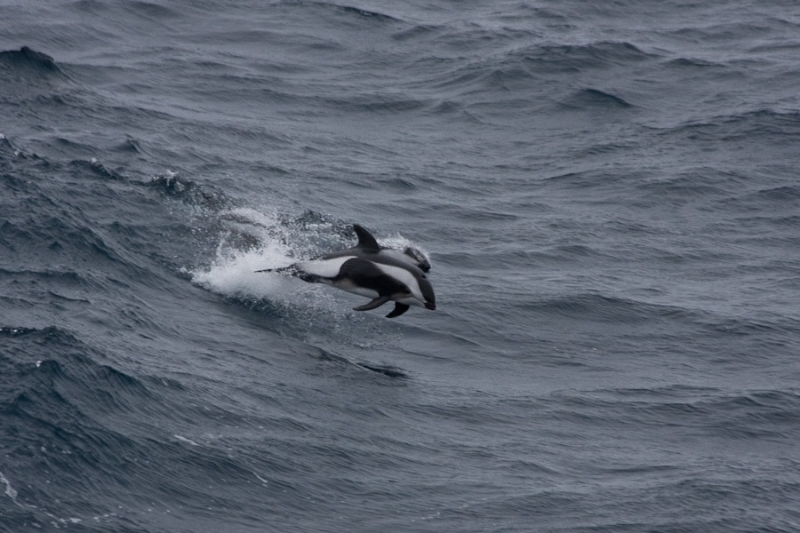 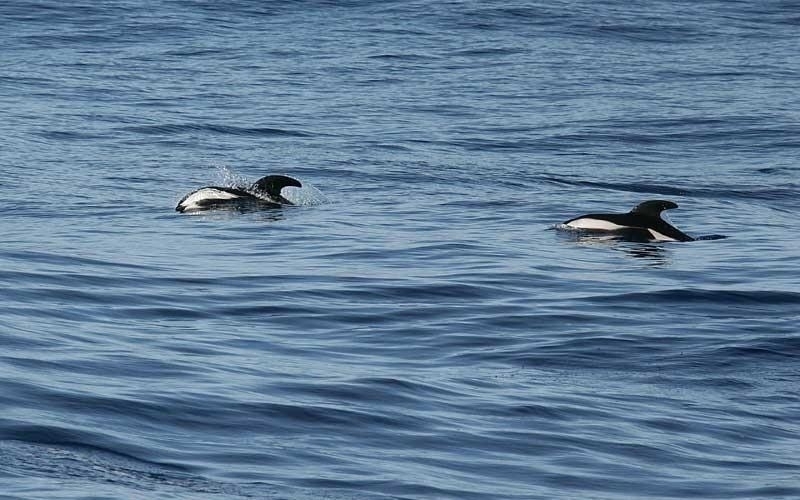 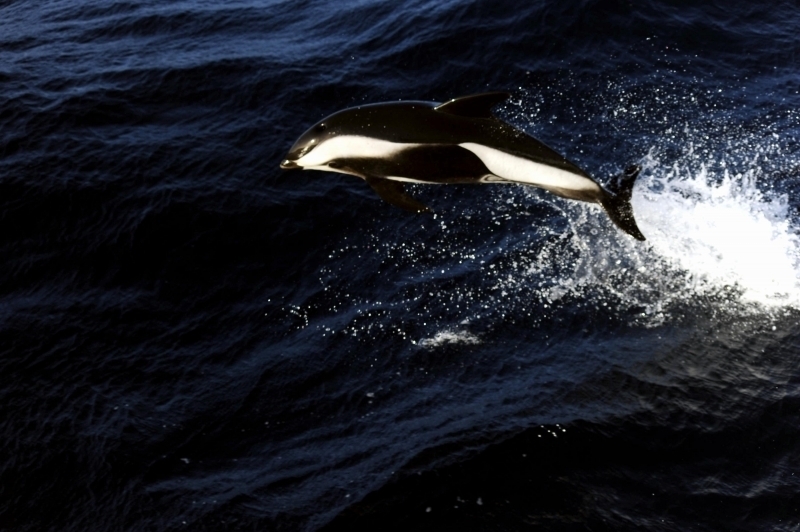 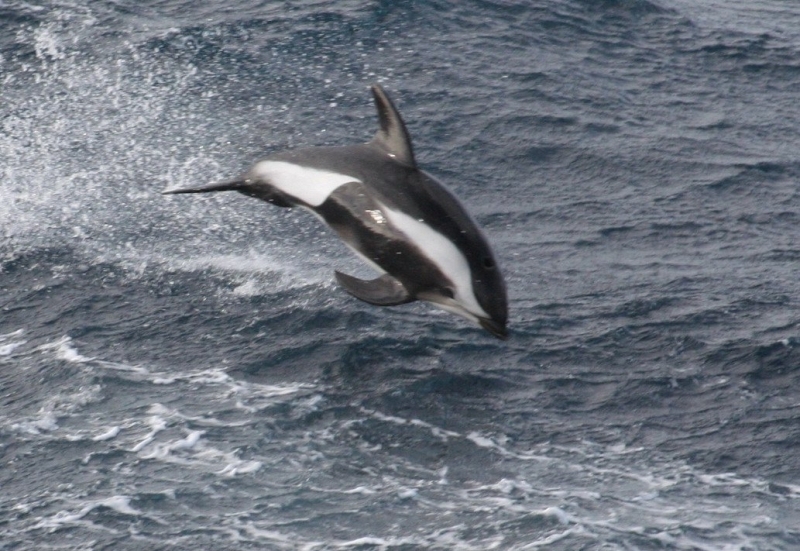 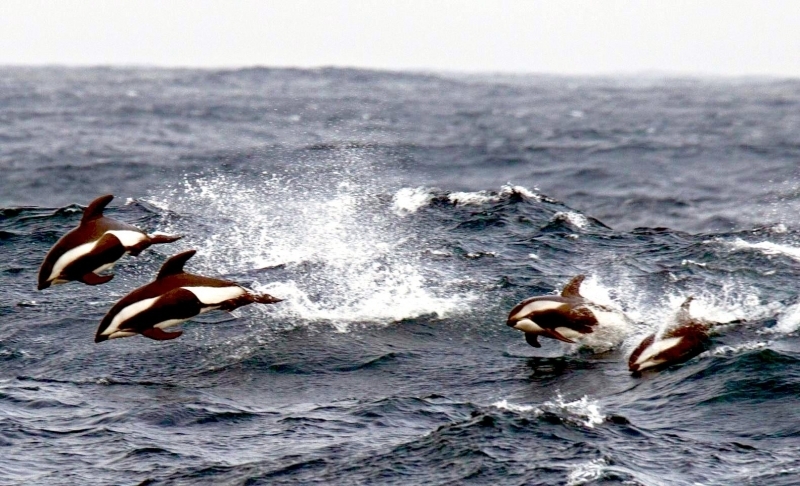 Hourglass Dolphins have been observed traveling with Fin, Sei, Minke, Arnoux’s Beaked, Southern Bottlenose, Long-finned Pilot, Killer, Southern Right Whale Dolphins & Southern Right Whales. 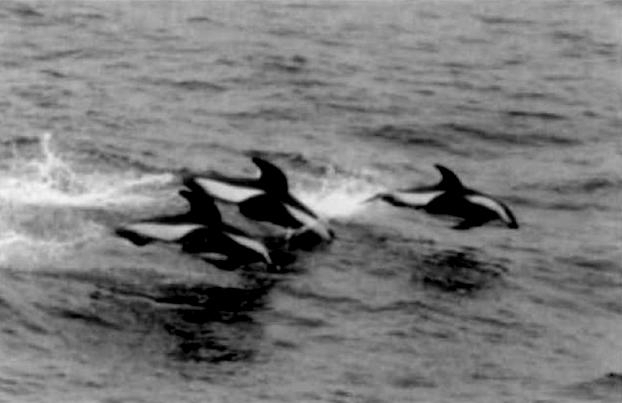 They have also been observed playing around large whales and appear to enjoy bow riding the waves of these much larger animals. 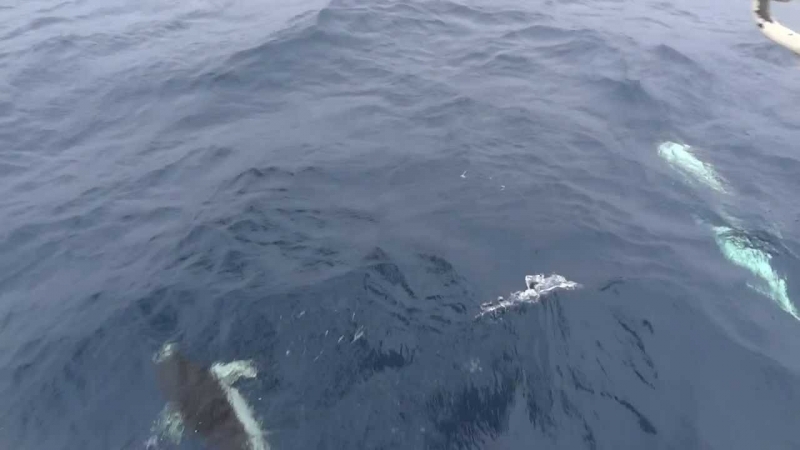 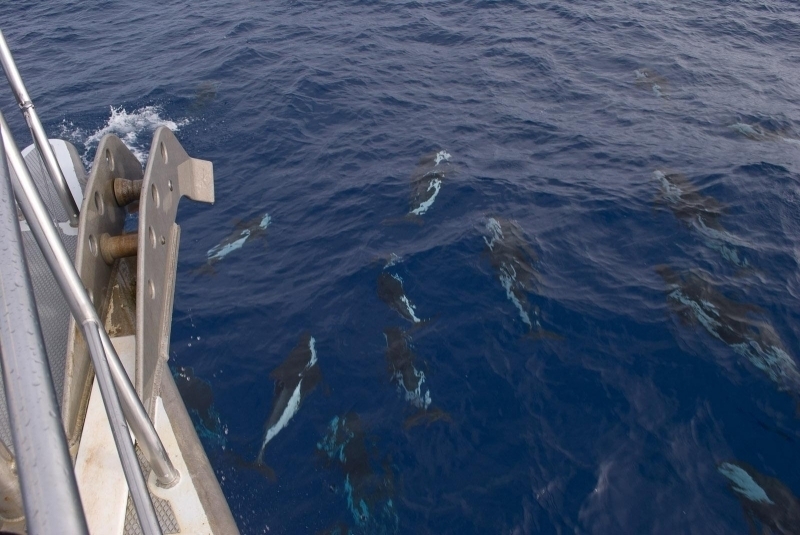 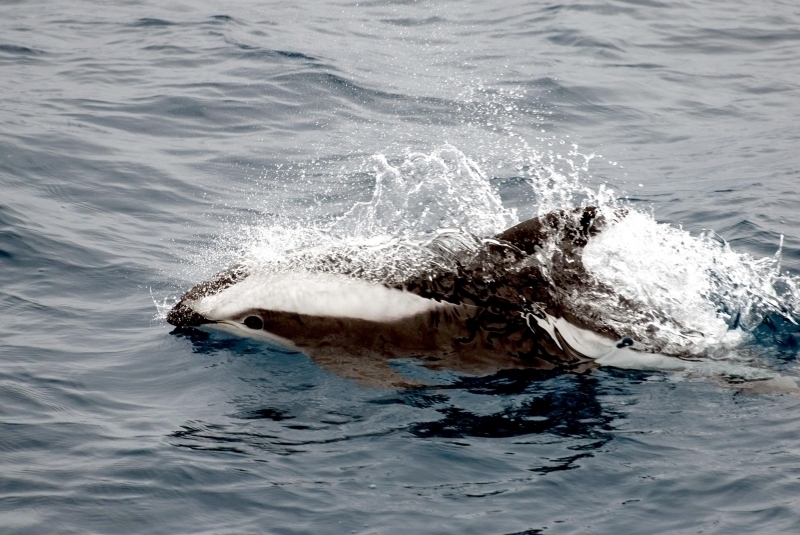 In terms of human interaction, Hourglass Dolphins enjoy bow riding & traveling with large marine vessels as well. 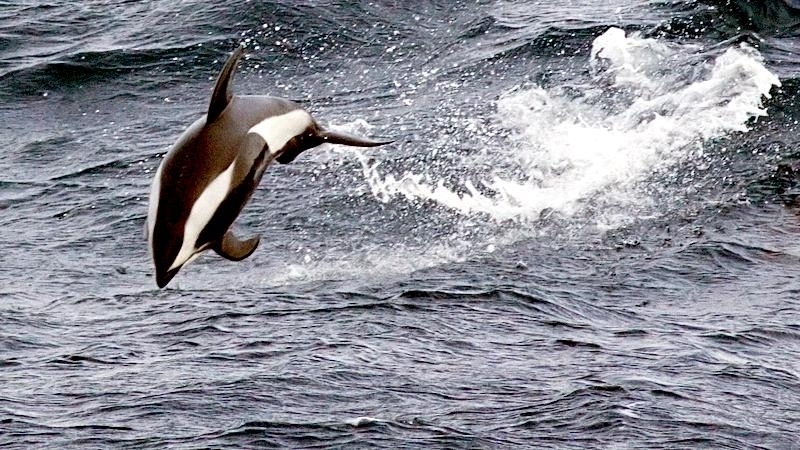 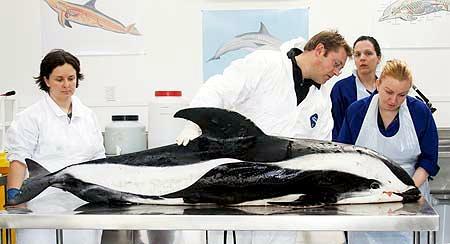 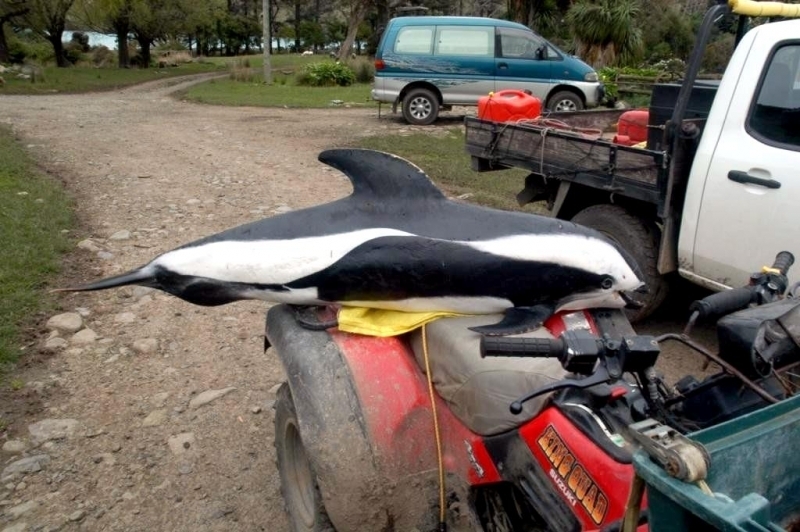 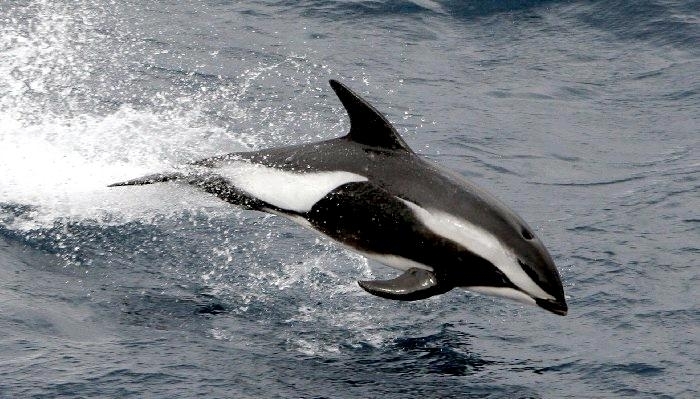 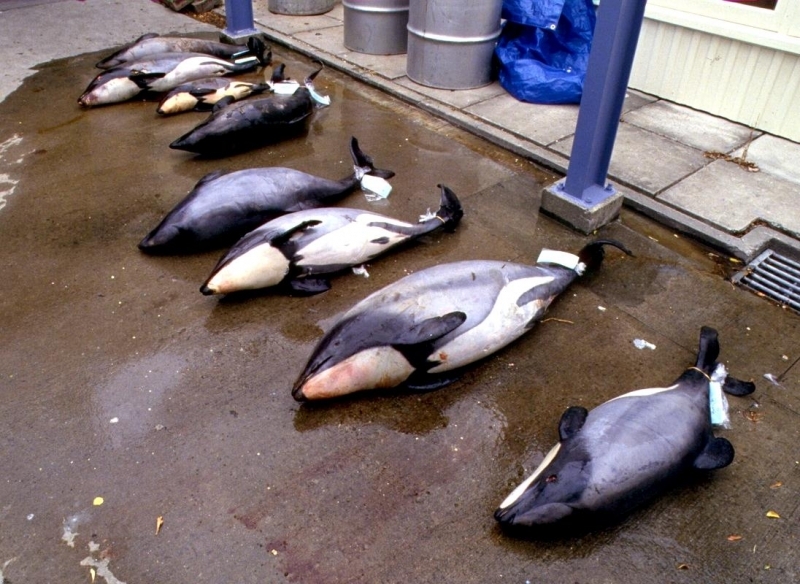 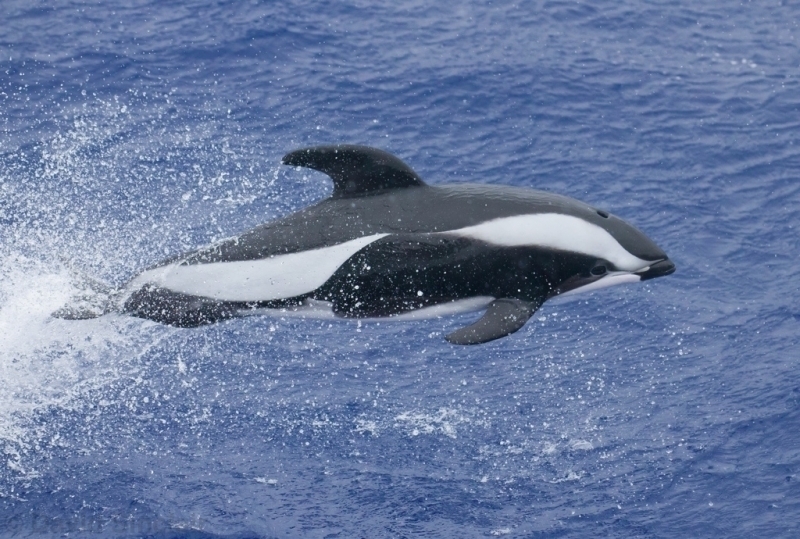 The lifespan of Hourglass Dolphins is not known, but is likely similar to other members of its genus such as the Atlantic White-sided Dolphin which lives up to 27 years and the Pacific White-sided Dolphin which lives up to 46 years. 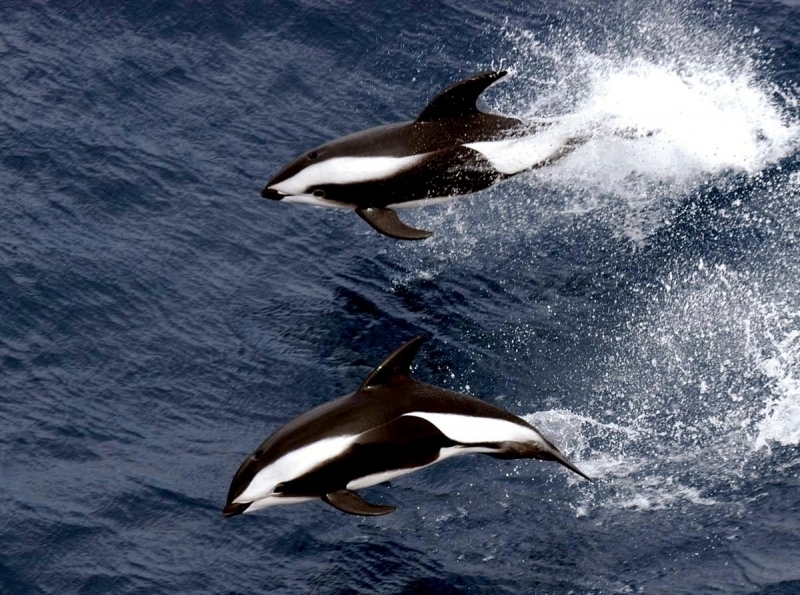 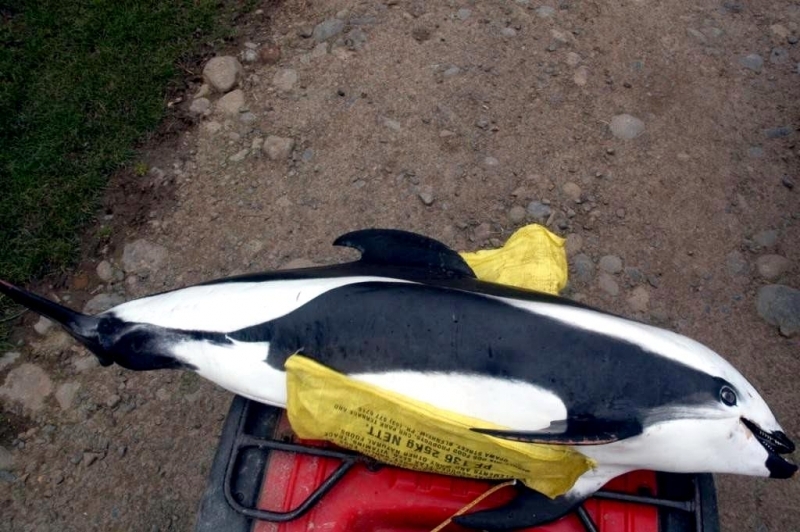 Hourglass Dolphins are found throughout the cold open waters of the southern oceans between 43°-67 °S and are widely distributed throughout their range. 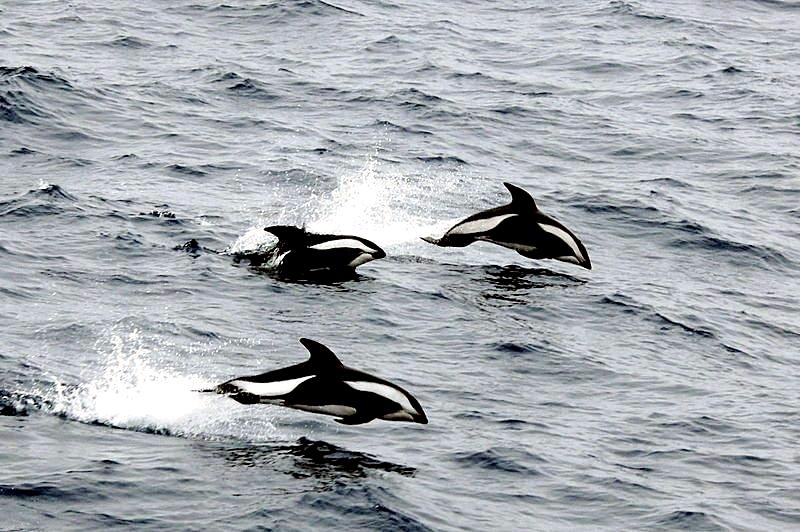 They’re found in waters ranging between -0.3-7 °C, although they prefer colder surface temperatures and are most commonly found in waters between 0.1-0.3 °C. 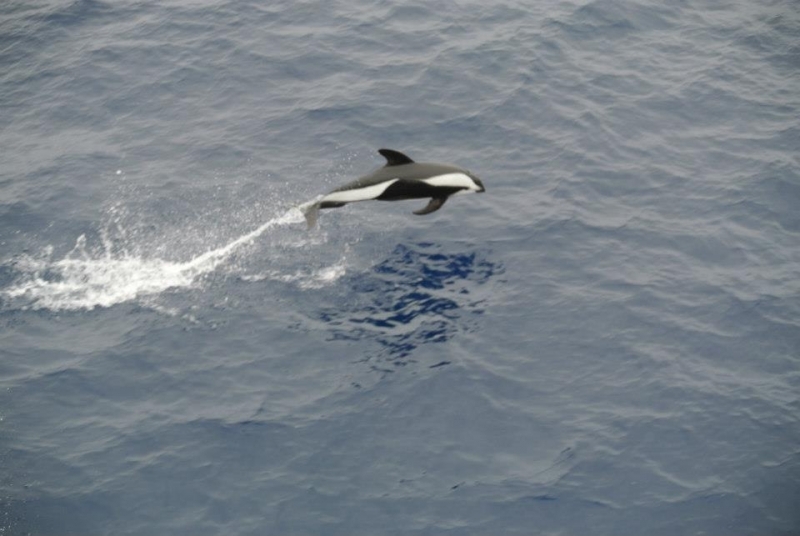 The warmest recorded surface temperature associated with this species was 13.4 °C. 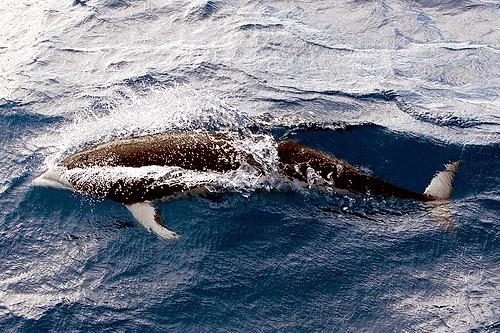 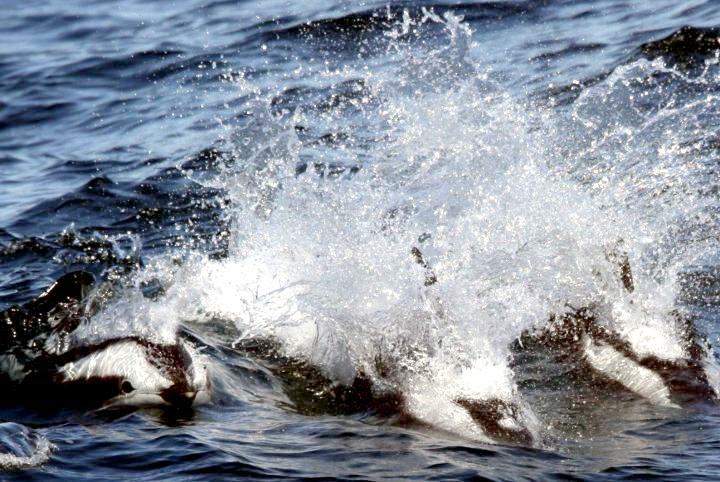 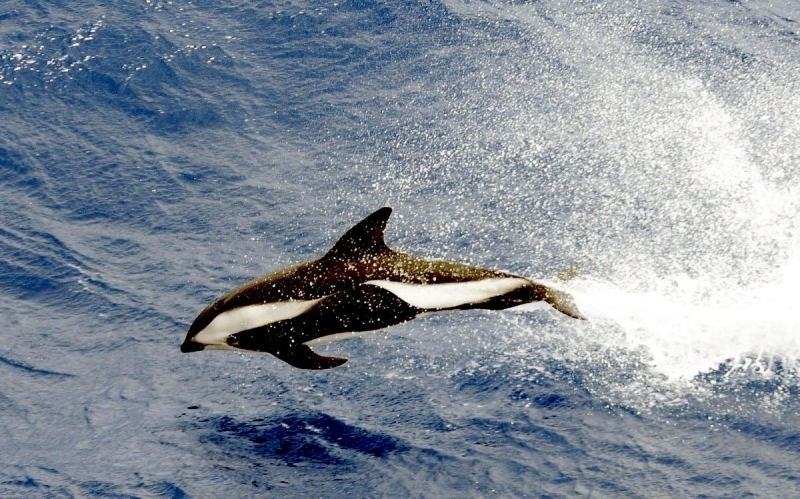 It is thought that the Hourglass Dolphin follows cold-water currents such as the west wind drift. 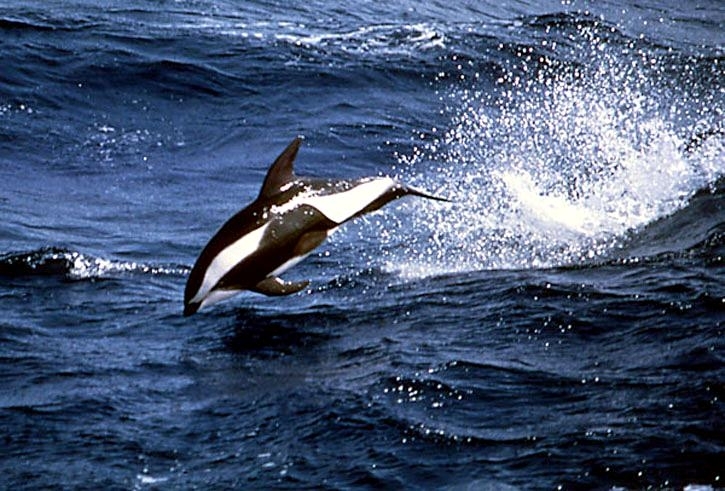 In the summer months, they are more common in cooler southern waters and in winter they appear to move further north. 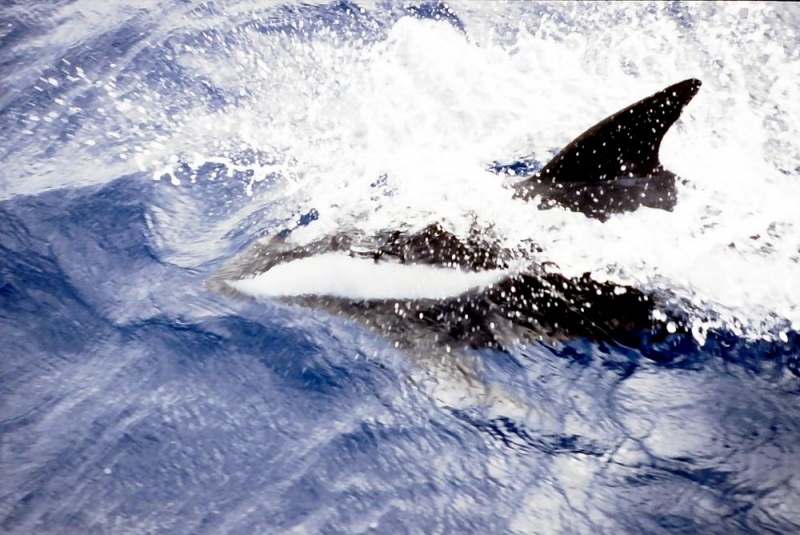 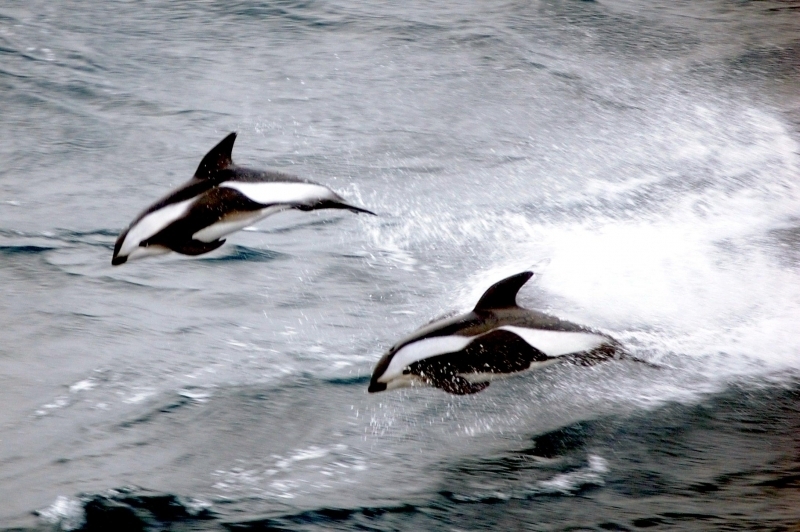 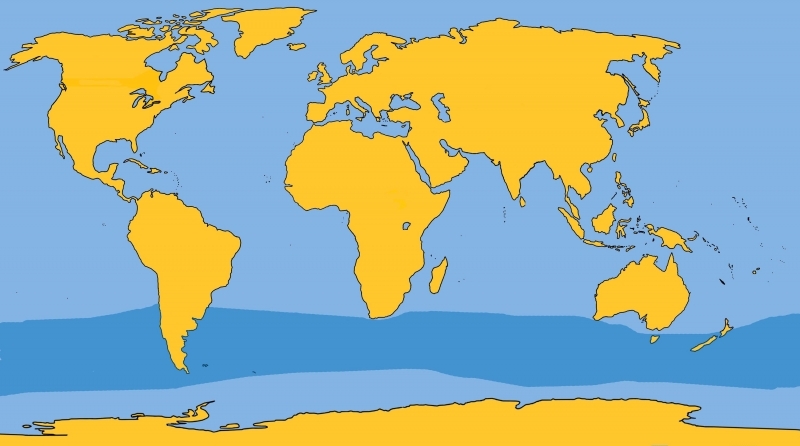 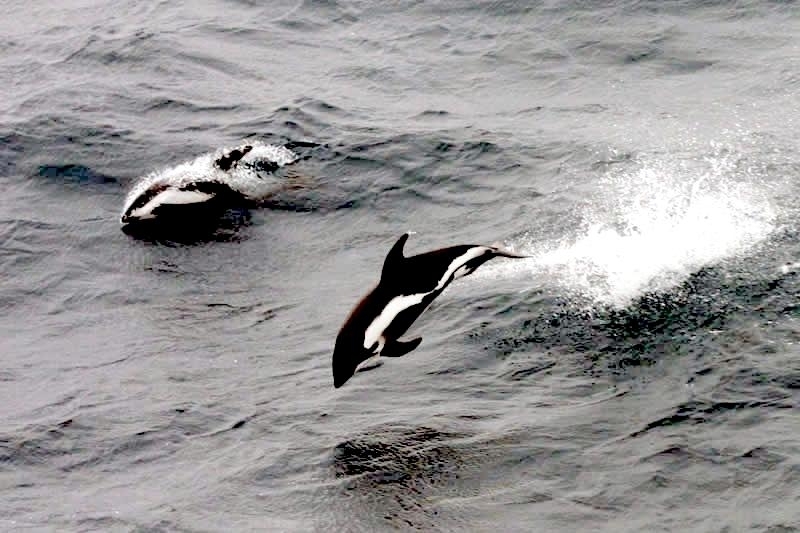 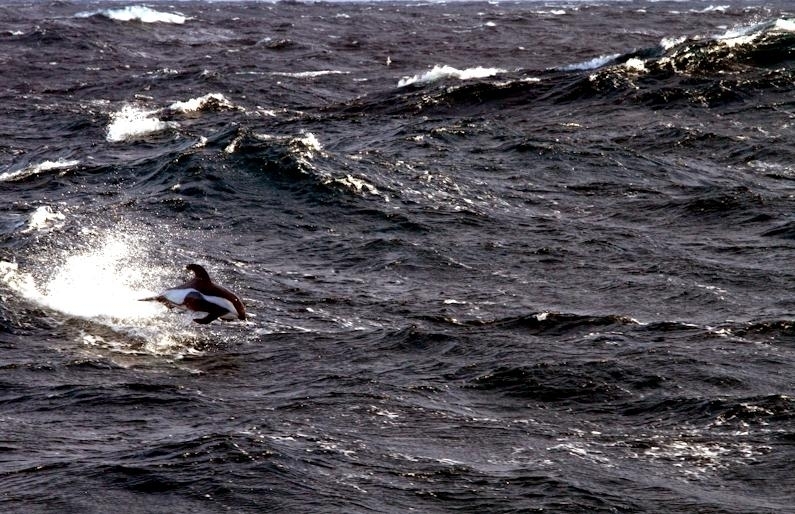 The farthest northern sighting of the Hourglass Dolphin was near Chile. 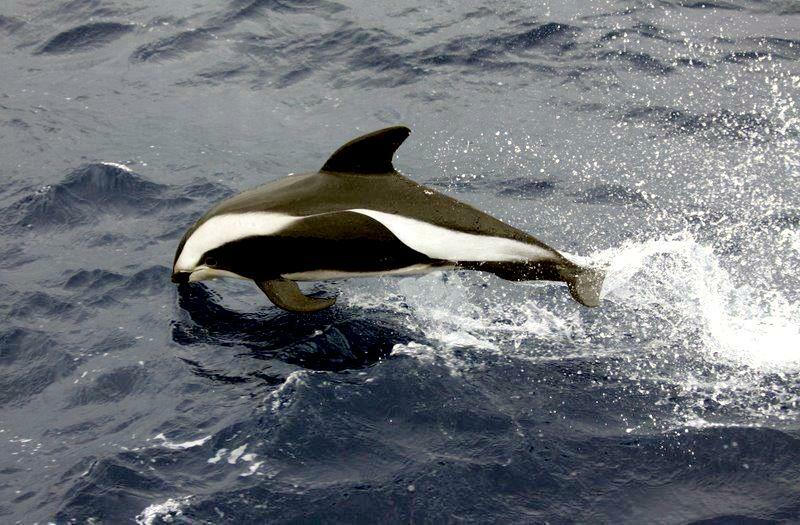 Hourglass Dolphins feed primarily on fish, squid & crustaceans. 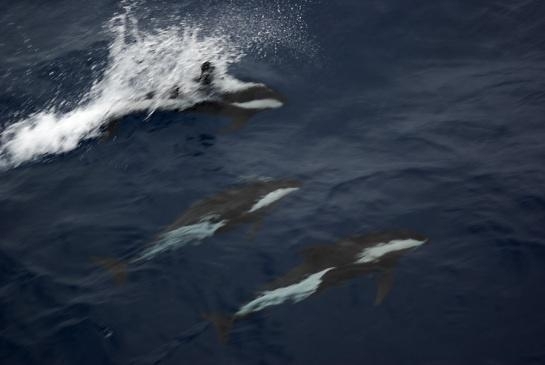 They have been observed feeding in large pods near the surface, which attracts sea birds and helps research vessels find pods of Hourglass Dolphins. 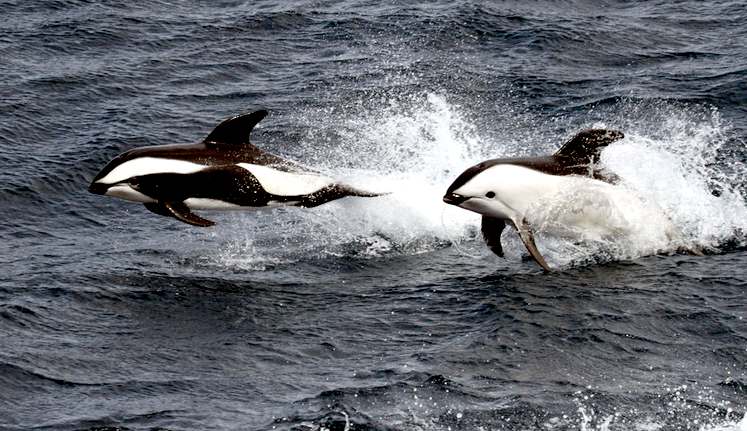 Based on limited data, female Hourglass Dolphins are thought to reach sexual maturity at a little over 1.83 meters in length, 2 males measuring 1.74 meters & 1.87 meters were sexually mature. 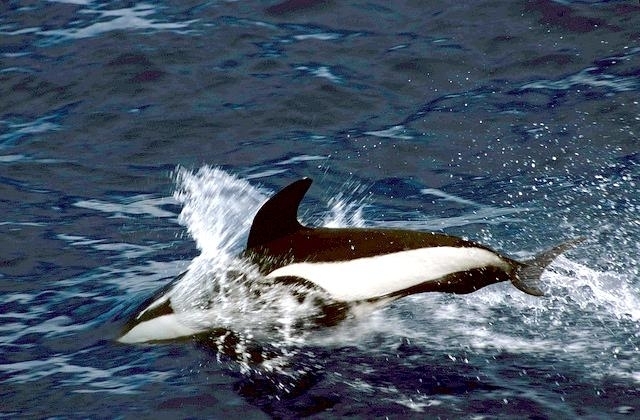 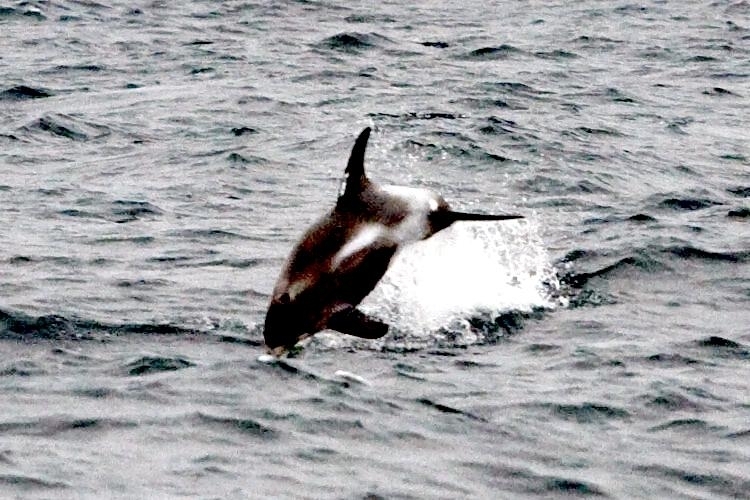 No data are available on the reproductive habits of the Hourglass Dolphin, however it is thought they give birth every 28.7 months to calves measuring 0.90-1.25 meters in length, have a gestation period of about 12.9 months, give birth between August-October and are nursed for about 12 months. 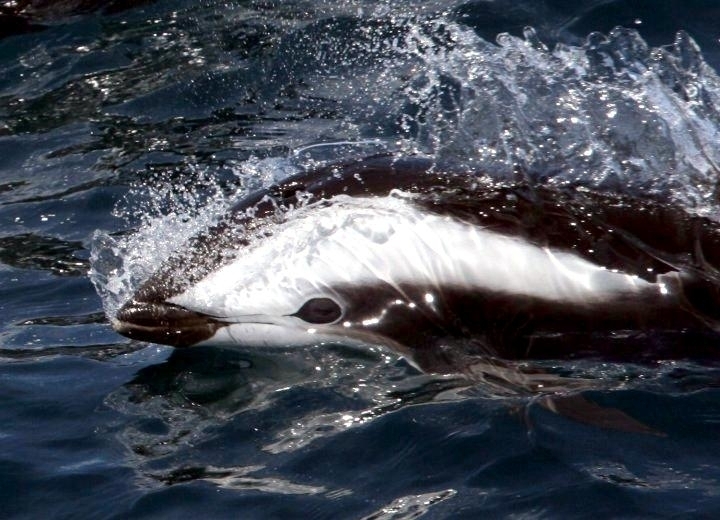 The global population of Hourglass Dolphins is estimated to be 140,000.